Our Executive gun holsters exceed the quality and durability that you have expected from our leather holster but we take it up a notch. Our Executive line adheres to the same quality leather, quality stitching, and quality hardware. What separates our Executive line from our leather holsters is the finishing work. You now can choose to antique your holster or emboss your holsters with a choice of six different embossings. 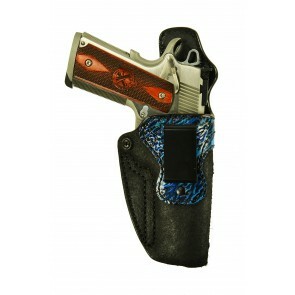 We also offer a variety of designs and color schemes all crafted and painted specifically for your holster. 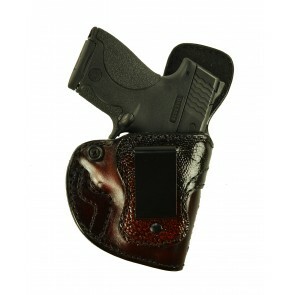 The Executive line is truly a custom made holster just for you. We have taken our most popular holsters to the next level in the crafting of our classic holster styles, merging superior form AND function to fit your needs both practically and aesthetically. 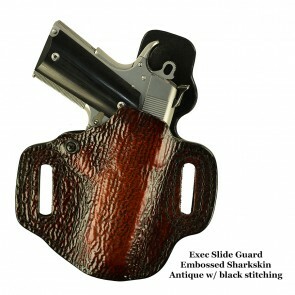 Our quality guarantees extend to our Executive line of holsters. Each of our holsters is meticulously crafted to meet our standards of excellence. We stand behind our products, aiming for absolute customer satisfaction, every time. 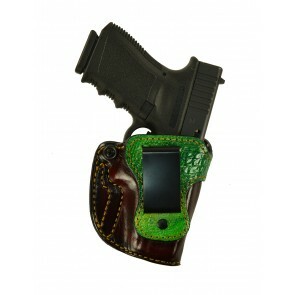 Like all High Noon holsters, our Executive gun holsters are handmade here in the U.S.A. from only the best materials. A range of customization options allows you to select the holster that will fit your brand and model of handgun perfectly; we also offer left- and right-handed versions of each of our holster designs. Whether intended for use in concealed-carrying, personal protection, or competitive shooting, any holster in our line of Executive gun holsters can be trusted to provide years of reliable service. Don't miss out! Choose the brand you trust and the style that sets you apart.